The fans are waiting to see Deepika and Ranveer in the getup of bride and groom and the most memorable moment of Ranveer Singh and Deepika Padukone’ life has come true. They will be soon tying the knot with each other. Both of them are famous Bollywood celebrities and their marriage will be performed according to their traditions i.e. Konkani and Sindhi. Deepika Padukone and Ranveer Singh hav0065 planned to host Puja before their wedding. This Puja will be prepared by Deepika’s Mother, Ujala Padukone. The wedding date of Deepika and Ranveer is 14 November 2018 which is already a very special day. The venue of their wedding is Villa Del Balbianello in Lake Como, Italy. According to the media report, both of them had departed from India to Italy on the 10th of November for their wedding ceremony. Anand Karaj tradition or Sindhi tradition. 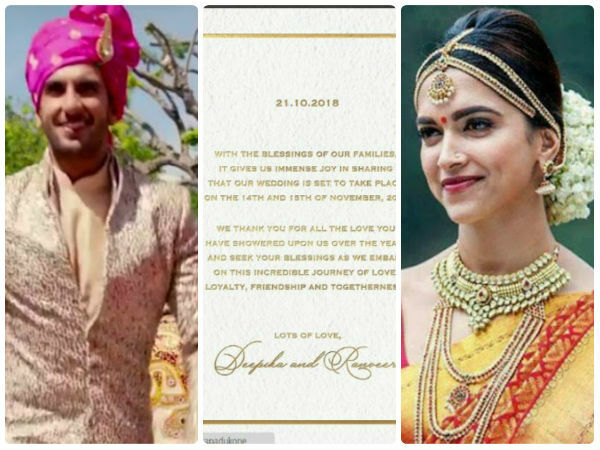 After the marriage, on 21st of November 2018, a reception party has been planned by Deepika’s parents at her hometown, Bangalore. A grand reception party has also been organized by Ranveer’s parents in Mumbai, at hotel Grand Hyatt on 28th of November,2018. On the 14th of November, the lovebirds will get married according to Konkani traditions and on the next day i.e. on 15 of November Anand Karaj ceremony will take place. According to Konkani tradition, Deepika will wear Saree and attractive gold jewelry and for Ranveer, Kanjeevaram sherwani. Ranveer has a grand entry on this special moment i.e. his wedding ceremony. Ranveer Singh and his family will arrive in a seaplane which has a seating capacity of only 14 persons. Deepika and Ranveer Singh will be attended by only their family and close friends. The number of close friends and family are only thirty. Some of the renowned Bollywood colleagues may join their marriage ceremony including Sanjay Leela Bhansali, Arjun Kapoor, and Karan Johar.